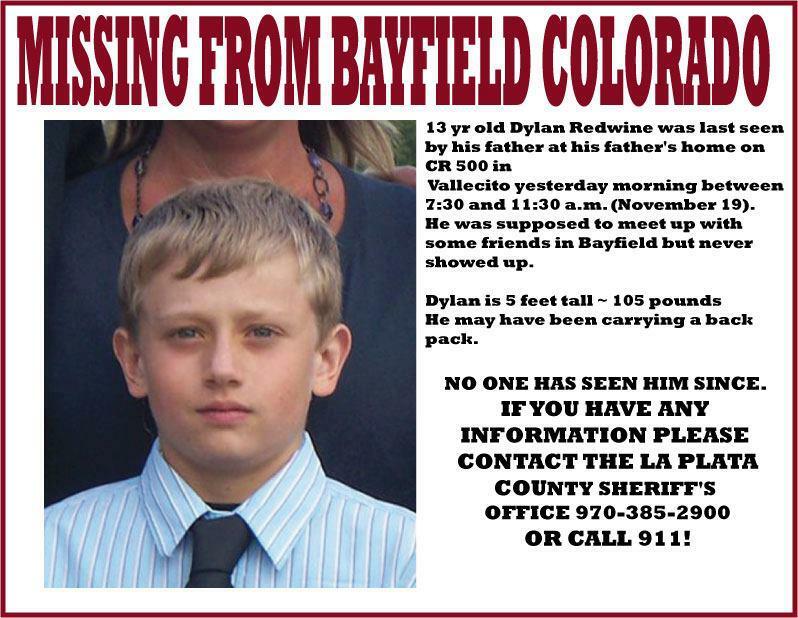 13 year old Dylan Redwine has been missing since Monday, November 11, 2012 in Vallecito, CO. Dylan was last seen at his father’s home in the 2300 block of La Plata County Road 500, which is north of Vallecito Lake near Bayfield. Dylan lives with his mother in Colorado Springs, CO but was staying with his father for the Thanksgiving holiday. His father, Mark Redwine, went to run an errand at 7:30 a.m. Monday; however, when he returned at 11:30 am Dylan was gone. Dylan was reported missing by his father the same day. Elaine Redwine, the mother of missing Dylan Redwine insists that someone knws where her missing son is and that “he did not go off on his own”. “He didn’t go on his own,” Elaine Redwine said of her son, Dylan, who was visiting his father, Mark Redwine, during Thanksgiving break. The couple are divorced and she lives in Colorado Springs. The missing boy is 5 feet tall, 105 pounds, with blond hair, blue eyes and fair complexion. He was last seen wearing a blue-and-white Duke Blue Devils baseball cap, black Nike T-shirt and black Jordan tennis shoes. “Dylan wouldn’t have left willingly,” Elaine Redwine said Friday during an interview at the home of a friend. “If there was any way to communicate he would have called.” Dylan was picked up Sunday by his father at Durango-La Plata County Airport, his mother said Friday. Dylan announced his arrival in a text message and ended it with the emoticon that is interpreted as a scowl, she said. This case has the appearance that Dylan Redwine might have initially run away from his father’s home as all signs indicate that Dylan did not want to be there. His visit was a part of a court-ordered Thanksgiving holiday visitation. Dylan, his mother Elaine and his brother recently moved to Colorado Springs, CO following his parents divorce. However, what happened after that might be something totally different. A Vallecito resident had seen Dylan walking with another boy Monday afternoon, but did not know that Dylan was considered missing at the time. A nearby resident who knows Dylan reportedly saw him walking with another young boy along La Plata County Road 501 in Vallecito Monday afternoon, but the resident didn’t know Dylan was missing until Tuesday. Anyone with information about Dylan should contact La Plata County Sheriff’s Office investigators Dan Patterson (970-382-7015) or Tom Cowing (970-382-7045). UPDATE I: Search continues for missing Four Corners boy Dylan Redwine. Volunteers have been making door-to-door contacts to spread the word about Dylan, and searching areas near where he was last seen. Five investigators from La Plata Sheriff’s Office are assigned to the case. Deputies and officers from other law enforcement agencies respond to any report of a young person resembling Dylan. On Friday, the sheriff’s office released new details about what clothes Redwine may have been wearing when he disappeared. The La Plata County Sheriff says he may have been wearing a blue and white Duke Blue Devils baseball cap, a black Nike t-shirt, black basketball shorts and black Jordan shoes. “We have not ruled out any possibility” said Dan Bender, Public Information Officer for La Plata Sheriff’s Office. For updates, provide your opinions and to read others, go to Scared Monkeys Missing Persons forum: Dylan Redwine.